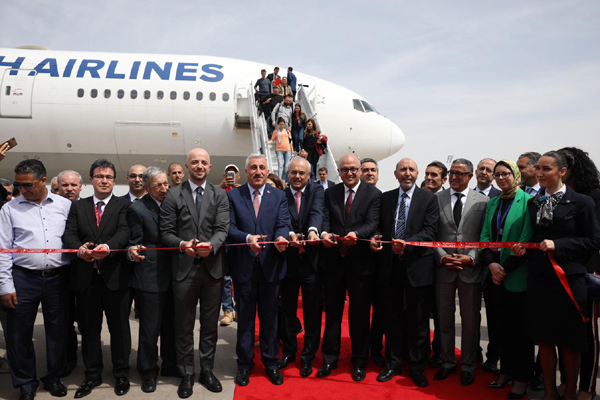 Flag carrier Turkish Airlines launched its inaugural flights to Marrakech, the crimson city of Morocco, from its hub Istanbul, thus adding its 308th destination to its global network. It is Turkish Airlines' second destination in Morocco. Successfully completing its “Great Move” process and transferring all of its passenger operations to its new hub, Istanbul, the national flag carrier's inaugural flight took off today (April 15) for Marrakech, thus marking the launch of five direct flights on the route every week. The inaugural flight, which landed in Marrakech Menara Airport, was welcomed by the customary water cannon salute in a formal ceremony. It was attended by the executives both from the global carrier and Marrakech Menara Airport, and press members as well. The flight TK 619 will take off from Istanbul on Mondays, Wednesdays, Fridays, Saturdays and Sundays at 11.30am and land in Marrakech Menara Airport at 2.30pm and on return TK 620 will take off at 3.25pm and land at 10:05pm, it added. This new route reinforces Turkish Airlines' title of flying to more international destinations than any other airline, said a top official. "With Istanbul Airport, a new era has begun in the global aviation. Our new operation centre offers an important opportunity for Turkihs Airlines to develop our globally unparalleled flight network performance even further. Thus, we are working on new strategies to capitalise on this opportunity," remarked Chief Marketing Officer (CMO) Ahmet Olmuştur. "Marrakech will always hold a special place for us as it is the first destination we added from our new home. We are happy to carry our passengers to this crimson city with our privileged travel experience," he added. Known as the “Crimson City” due to the colour of its soil, Marrakech offers tourists and travelers the opportunity to experience the entire allure of North Africa in a single location. Bringing historical buildings, famous mosques and colorful flower gardens together at the foothills of Atlas Mountains, Marrakech is well on its way to become one of the favorite tourism centers of the world, stated Olmustur. "As the first capital of Morocco, whose name means “Land of God” in the Berber language, Marrakech’s streets are teeming with the historical heritage of various cultures," he said.